These medium denim shorts are perfect for playtime, With rolled up cuffs and detailed pockets on the backside. The shop Little closet has these shorts in a handful of colors from bleached to black. 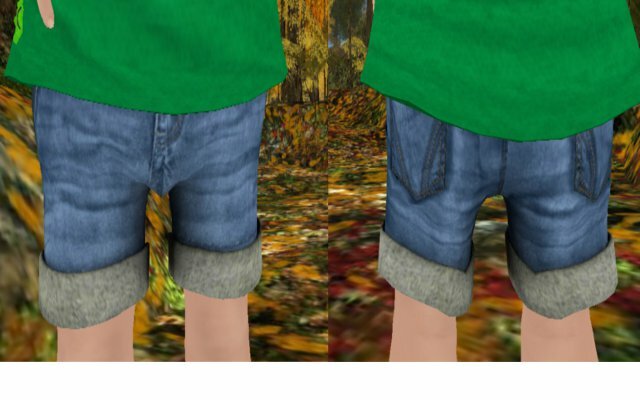 The hulk shirt is highly detailed and fits perfectly over the Mesh shorts while giving off a perilously bagging look when it comes to the bottom Hem, It can be found at Soken kidslabz both Inworld and at there marketplace store. Lastly the Pasta necklace is a Gotcha from Rainbow flakes, One of the many items you can get for 5L a play at there mainstore. Today’s outfit is simply but cute, And who doesn’t love Pandas? The adorable Panda tee shirt is form a Store called Geeks, The front is decorated with black splotches to resemble a Panda’s face and includes a little Panda paw print on the side. These Jeans are textured layer with included Cuffs, And are a nice strong shade of green. They come from a store called Boogers which has other colors available for a affordable price. These cute little pointed ears are from Cutebytes, There are a few styles of Piercings to choose from and each set Includes a naked version as shown above. They come with easy to use Color hud or can be colored using the main Toddleedoo control hud and can be sized to fit your liking.